Hello lovely friends and visitors. I am just popping in very quickly to wish you all a happy healthy and above all creative new year!! Here are two of my journal pages to ring in 2019, I will be back with far more details on Friday. Thank you all so much for all your support, even though I have been such a bad blogger this year. Hello lovely friends and followers, thanks for checking in here this Friday, which from now on will be the day I post here. 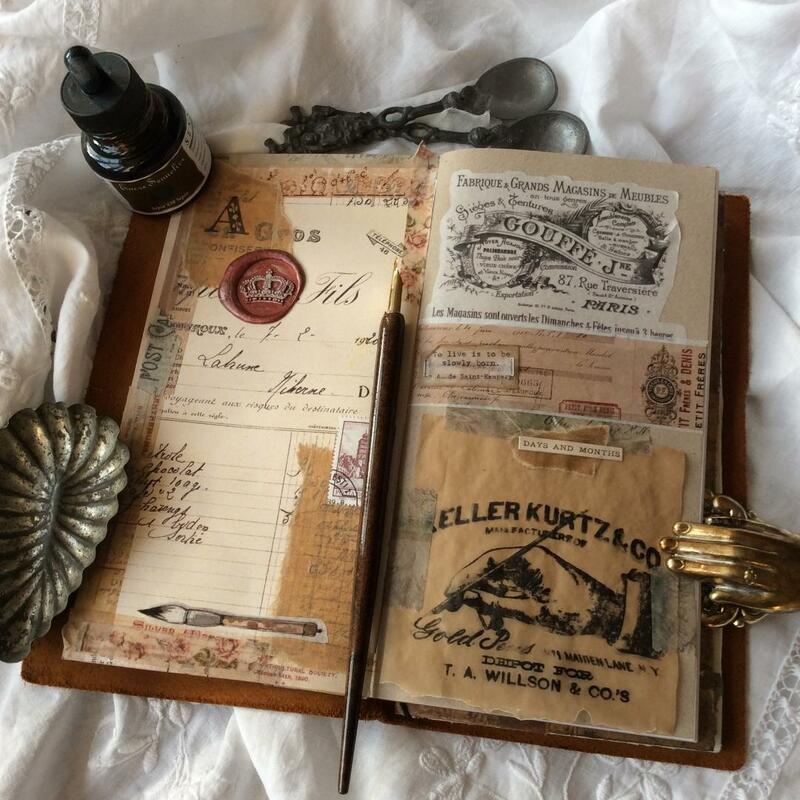 I used the Eileen Hull journal die to cut the cover from mounting board and then decorated it with various Tim Holtz products, - collage paper, ephemera, a paper doll and some stamped elements. The background to this lovely lady was a stamped piece of card, using one of Tim's new background stamps, to give her something to stand on I added some cheesecloth, adhered with mat medium. A few ephemera tugged into the side and some splatters for a wintry feel. Here is the back, just some coloured collage paper. I added some glitter to the berries, to add a bit of sparkle. The inside of the cover was made with a piece of Stamperia rice paper. I used a lot of traditional Christmas colours for my cards this year, and wanted to use some different colours for the rest of the journal. Alright, now to some of the inside pages. All of them in my favourite vintage style, using scraps of rice paper, paper serviettes etc from my stash, - so good to use up some of those hoarded pieces. The challenge is always to integrate these scraps into the rest of the page, using paints, stamps etc. This page uses another scrap from the Stamperia paper and a paper doll. I tried to pick up some of the colour from the paper in the background. I always think that adding some shadows to these collaged people really helps to integrate them into the page. The quote I found in a wonderful alternative advent calendar which has a quote for each day. Another wintry page. At the bottom I added some stencilling with a brick stencil to link to the bricks on the image. At the top another bit of the collage paper. And here is the final page I will show today, using a paper napkin for the main image and then some paint and stencil work to pull it all together. As you can see I also used some washi tapes to kind of frame the main image. Like usual, thank you so much for your visit and I hope you can find some creative time during these last few busy days before the 25th! Life is busy for all of us, and the older I get, the more I want to use my time creatively. I love to craft and create art, but I am tired of writing blogposts and spending ages and ages going from blog to blog, to see what others have created. Blogger is such a time consuming platform!! It's not that I don't like seeing what other crafters and artists make, in fact, I love it, and it mostly really inspires me enormously, but blogger is no longer the place for me to do that. I much prefer Instagram and even Pinterest. I don't like Facebook and have pretty much stopped using that. But I also know that I have many followers here, so I have decided to make Friday the day when I will write a blog post and show some of my stuff. If you would like to see my work more often, follow me on Instagram, (link in side bar), where I post usually 3 or 4 times per week. That's also where I love to see and appreciate the work of the people that I follow. Well enough of the waffle, but I just wanted to be honest. Today I am sharing some of the Christmas cards I have made this year, they were inspired by Tim Holtz's Holiday Hacks. This is just a small collection. Another sample using the same set, but with a different sentiment. The poinsettia was stamped separately on white card and then fussy-cut and adhered. The next few cards all use just the Overlay stamps in different combinations and colours. Because I can never just do clean and simple, die cuts and other little embellishments were added to the cards, and to some of them I also added some white splashes for a wintry feel. This is what Julia had to say about the challenge: "This month we are asking you to create with stars. Fill up the dark winter sky with them or use one really big one as your central focus. Stencil them, stamp them, emboss them or die cut them. 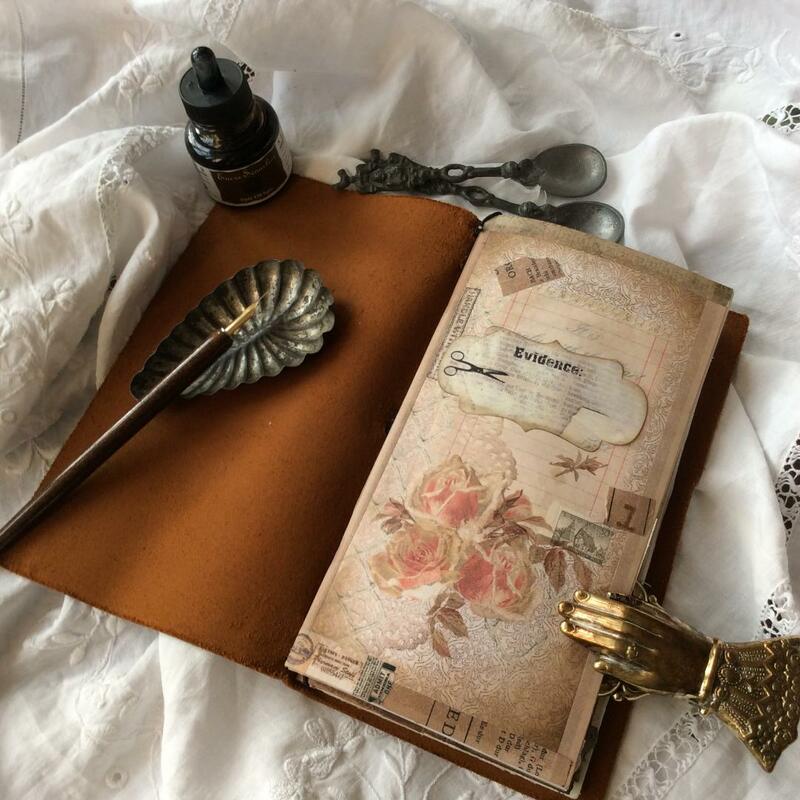 Make a card, make a star box, make a canvas, create a journal page - remembering to create in the vintage, shabby, mixed media, art journaling, industrial or steam punk styles". Well, there you have it, plenty of chance to become creative, - sometimes the best antidode to this super busy time. Anyway, on to my project. Unfortunately the light has been so bad here lately that I have no process photos, but I'll try and give some steps on how I put this together. I started by covering the canvas with gesso and when dry added a number of different chip board and metal pieces that I had been hoarding for just a project such as this. Next everything was cover with a number of different colours of Decoart paints, until I was happy with the overall effect. I also added a Sizzix tree die cut I had coloured with various Distress Inks. Because stars were to be a feature of the challenge I then added some stars using a couple of Tim Holtz stencils and some texture paste and while that was still wet sprinkled on some Distress Glitter Dust in Vintage Platinum in various places, including on the tree. A die-cut sentiment, cut from metallic Kraft card was added in the background. And finally one of Tim Holtz Paper Dolls. .And some texture paste sprinkled with Clear Distress Glitter Dust to give it a bit more of a wintry feel still. Some berries and die - cut branches, little cones and leaves finished it all off. and hopefully you will find the time to play along with our challenge, - we always love to see what you create. Hello friends, welcome, can you believe it's the last day of November? Well it is and it's also the 5th Friday and that means it's Tag Friday at A Vintage Journey. I started with a large tag and stamped with Versafine Dove Grey, In inked around it with Distress Inks in Antique Linen, Stormy Sky Chipped Sapphire and Wilted Violet. I then painted over the stamped image with what I though was transparent silver Aqua Tint. Big mistake, the paint is not totally transparent and I lst most of the detail of the stamp, even though it gave me a lovely silvery shimmer. Finally I added the stars in the background using the little star layering stencil by Tim Holtz, using silver embossing paste and then sprinkling Vintage Platinum Distress Glitter while the paste was still wet. For the tag I used the other main stamp in the set. I wanted some gold shimmer and this time thought I would add some gold Aqua tint to start with, then use my inks and stamp the image as the last step. Sadly the result was not much better, as again I lost a lot of detail which I then added in in the same way. I added a strip with one of Tim's 3D Dresden trim dies and a little snow flake charm. And this time finished the tag with some gold embossing paste, which like usual with anything shimmery I find almost impossible to capture on a photo. Well, that's it for now, - if you like tags, do check out what my teamies have created for your inspiration by clicking HERE, and we would love it if you add any tags that you have made. Thanks for your visit like always and happy crafting! This one uses the Holiday Greetings stamp set. The background was done with Antique Linen and Frayed Burlap Distress Oxides. I stamped some trees from a much older set in the background, using Iced Spruce Doxide. The main card was mounted on a piece embossed with the Lumber 3D folder, coloured with Distress Inks in various brown tones and then I applied a layer of Crazing Medium with a palette knife, a cool trick I learn from my lovely blog friend Sara Emily from Saras Closet After the crazing medium had dried I then rubbed in some Distress Crayon with a damp finger, to bring out the cracks. I also drew in some stars with a white gel pen and added a little sparkle with Diamond Stickles. I then finished it with a die cut coloured with Doxides and then I added just a tiny bit of Distress Glitter in Vintage Platinum, it looks really sparkly in real life but it all gets lost in the photo.